Love him or hate him, there’s no denying Sanderson’s ability to pump out wickedly interesting stories. And with Calamity – the final book in the Reckoners series – only a week away from its release, I thought it apt to read Sanderson’s first ever published novel, Elantris, to supposedly discover where the magic began. Like all Sanderson stories, the premise is infuriatingly simple. Elantris – the city of the demigods – was once a place of glory and wonder. Every few days, the Shaod – the undercurrent of magical energy – randomly transformed citizens from the surrounding capital Arelon into powerful magic-wielding and immortal demigods. Consequently, these demigods were loved and worshiped. But then the magic stopped. The demigods lost their magic and the city began to crumble. However, the Shaod still continued to transform citizens, forcing them into a life of endless torment. The pain from every bump, every bruise, and every cut is felt by the Elantrian forever, until his or her mind snaps from the agony. Elantris is now feared and hated. And this is where the story begins. Sanderson extrapolates his story through three protagonists. The first is Raoden, prince of Arelon, and newly blighted Elantrian. Then there is Sarene, a fierce and antagonistic princess, come to marry her husband, Raoden, to seal a diplomatic deal between their two neighbouring lands. Finally, there is Hrathen, a religious fanatic intent on exposing Elantris as a city of heathens, whose purpose is to raise Arelon from the shadows and into the knowledge of his one true God. For me, Elantris definitely felt like Sanderson’s first ever book. The story is dense and complicated, ofter marred by too much politicking and religious digressions from Sarene and Hrathen. Of the three interwoven stories, I only cared about Raoden’s. In my opinion, Sarene and Hrathen simply served to slow the pace of the plot. I also felt as though Sanderson hammered in Sarene’s whole “independent woman” aspect too hard with this readers. Simply put, Elantris is a trudge in many places. Compared to his other novels, Elantris is also quite weak. The characters are only mildly interesting and the conclusion of the story felt too contrived for my liking. The story is embargoed with religious and societal commentary; though this isn’t surprising as Elantris was Sanderson’s thesis for his Master’s degree. Ultimately, the story is driven by the underlying mystery of Elantris and its sudden decay. While the answer is revealed in the end, I thought the overall story too long. 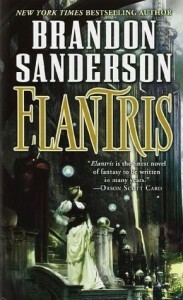 This said, I still feel as though Elantris is a staple in Sanderson’s stories. It is also a fitting beginning to his Cosmere universe, including Hoid, his most mysterious and interesting character. While it’s not my favourite Sanderson novel, Elantris still has its memorable moments. If you haven’t yet read Elantris, and you’re a fan of Sanderson, I’d recommend it. However, if you’re ignorant to all things Sanderson, perhaps his “Final Empire” series is a more fitting tale for you to begin with. Patrick is currently being treated for bibliophilism in Canberra, where he lives with his partner. He is known to read almost anything and is always looking for more recommendations for his walk-in library. For more on Patrick and his writing, visit his Author page on Goodreads! I am completely taken by Sanderson’s writing, but I’ve been waiting for the final book to come out in this series to start it! The Mistborn series is just amazing. So great to hear that you enjoy Sanderson’s writing style. After 3 guest posts (all on Sanderson books) this month I think I am ready to pick one up for the first time very soon! And Mistborn sounds like a great place to start.